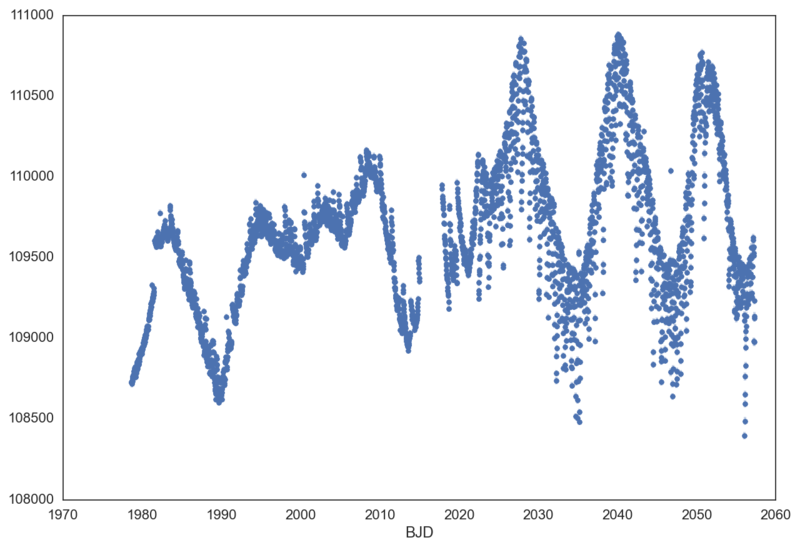 K2VARCAT Extracted Lightcurves - Armstrong et al. The lightcurves from K2 contain larger systematics than the original Kepler mission, due to the reduction in pointing precision as a result of having to rely on only two reaction wheels. Armstrong et al. have created a technique to correct for the pointing-dependent nature of the pixel-level fluxes. The team have released their extracted lightcurves (using a photometric aperture defined by the brightness of the target), as well as three plots of the resulting lightcurves: extracted, detrended, and phase-folded. The lightcurves are stored in FITS files a binary tables in the first extension. The header also includes information on the aperture size used and the coordinates of the aperture center. The team has also released a catalog of object classification derived using supervised and unsupervised machine learning. Sources are assigned a classification probability for each of several variability classes. The most likely classification is included in the "Class" column as a string. You can download the entire catalog using the link in the Data Access section. The catalog values are also available in the Search Form output results and on the individual target pages that are linked to in the output results. _llc-detrend.png = A plot showing the detrended lightcurve. 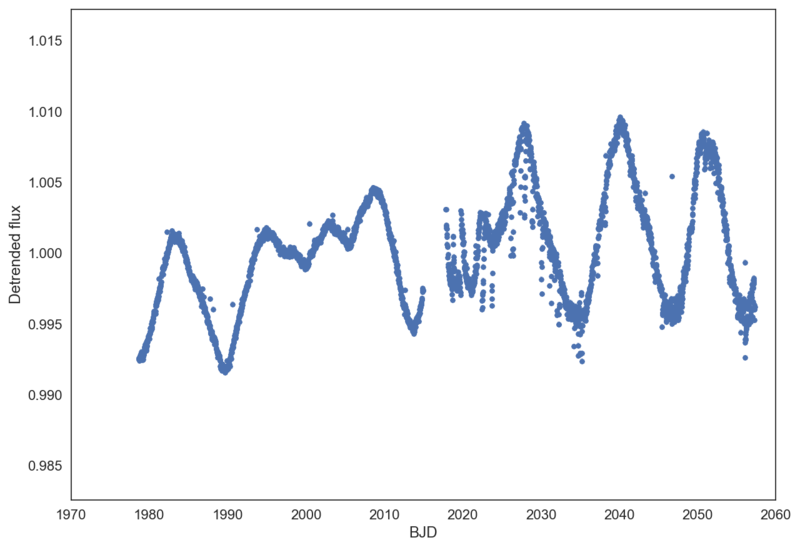 _llc-detrend-thumb.png = A smaller sized version of the llc-detrend plots. _llc.fits = FITS file containing extracted and detrended lightcurves. The first extension contains a binary FITS table that includes the timestamps, extracted fluxes, and detrended fluxes. _llc-orig.png = A plot showing the extracted (but not detrended) lightcurve. _llc-phase.phase = A plot showing the detrended lightcurve phase-folded on the best period. If no period is found, a default (empty) plot is used. 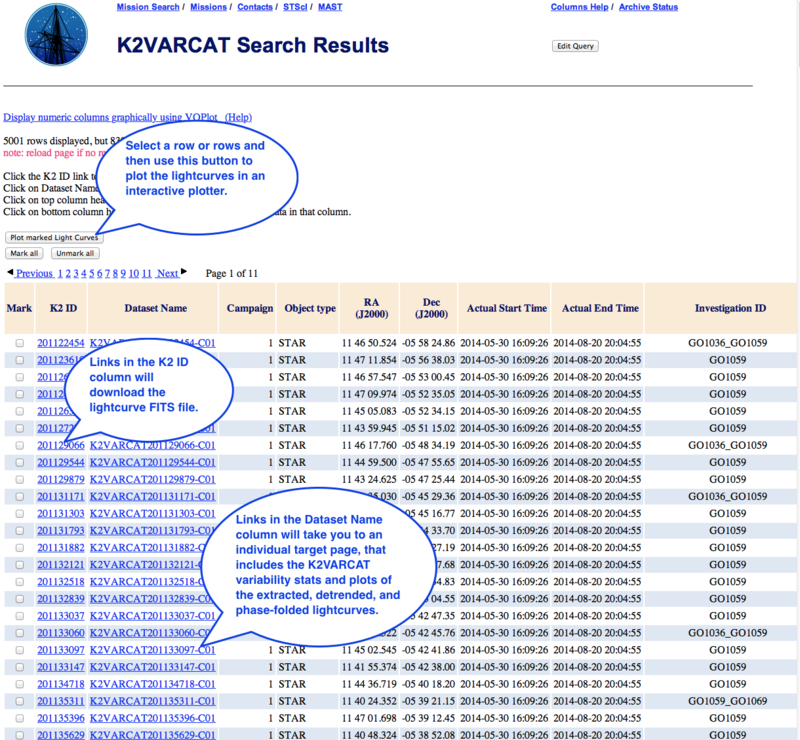 We strongly recommend using the MAST Discovery Portal as the primary search interface for the K2VARCAT lightcurves. The Portal allows you to search for, and access, all data at MAST (including the K2 mission data like target pixel files). It also features a variety of tools, such as an interactive plotter, a sky viewer with footprint overlays, and cross-match functionality. If you'd like to sort and filter the catalog of classification statistics from the machine learning analysis, you can use the Interactive Tables. There is one for each Campaign. While the tables are flexible, please note that due to the large number of rows it can take longer than normal to sort of filter, so please be patient. You can download extracted lightcurves in bulk using wget or cURL scripts. In the table below we provide cURL scripts to download all the extracted lightcurves available for a given campaign. You can also generate custom wget or cURL scripts to download large subsets of the data using the K2VARCAT Search Form (see below). Just change the "Output Format" before initiating the search. Instead of displaying your search results in a table, a script file with wget or cURL commands will be downloaded to your machine, which you can then execute with an "sh" command in a terminal to sequentially download each lightcurve in the file. A direct link to the full variability catalog is also provided in the table below. 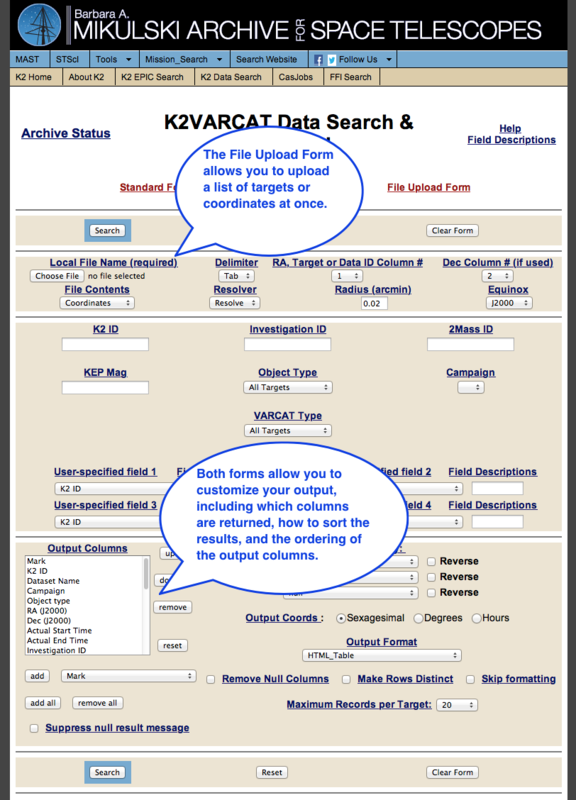 Some users will want to use the K2VARCAT Search Form to search for and retrieve lightcurves for targets. 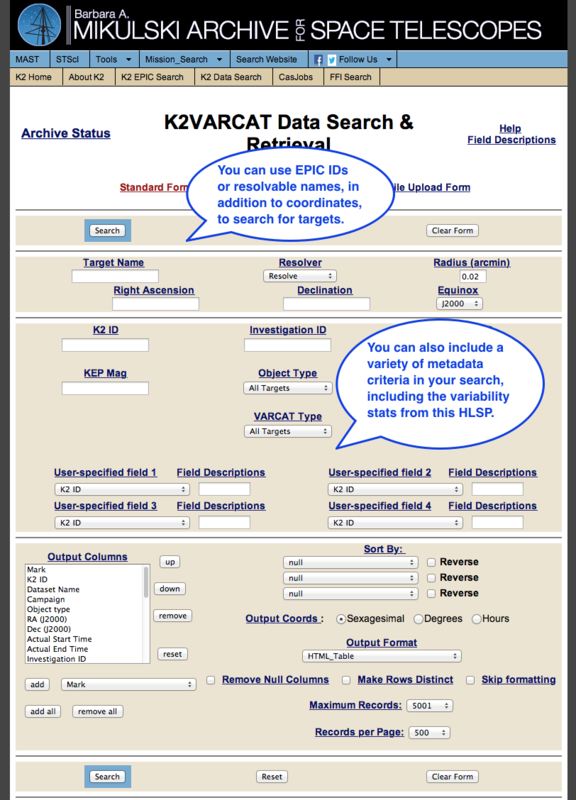 The Search Form allows you to search based on metadata (such as fluxes from the EPIC catalog or classification probabilities from this HLSP), coordinates (via cone searches), or target ID (including the EPIC IDs). You can search for a single target or upload a list of targets. Once you have your search results, you may download the lightcurve FITS files, interactively plot the extracted or detrended lightcurves, or visit individual target webpages that contain K2VARCAT variability stats for that object, as well as plots of the extracted, detrended, and phase-folded lightcurves. The interactive plotter allows you to plot one or more target lightcurves with zoom capability. 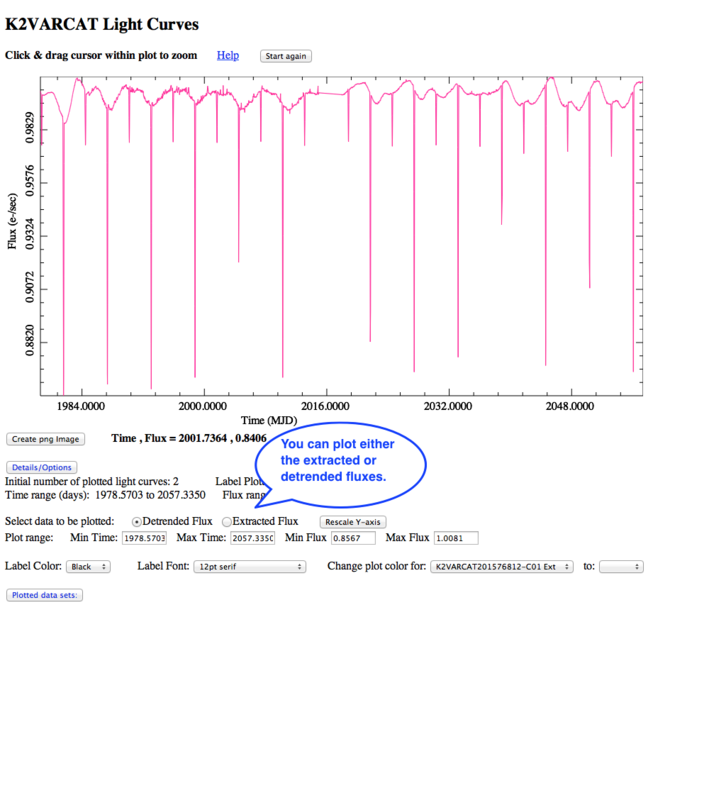 You can plot the extracted or detrended fluxes.